I hope you're all full and fat just like us right now. I just wanted to write a little post real quick to tell you guys how incredibly THANKFUL I am for each and every one of you. I'm more thankful than you'll ever know. Oh my shay shay and DDHP. I just want you to know that I am sitting here writing you this comment all while a non-declawed black cat is sitting on my lap and oh yeah btw I am deathly allergic to cats but I had to get this comment in and published before my battery went dead so I hope this proves to you guys just how thankful I really am for you. As I tell my kids... To the moon and back!!!! Haha that picture is so funny! Hope you had a nice holiday! LOVE this! 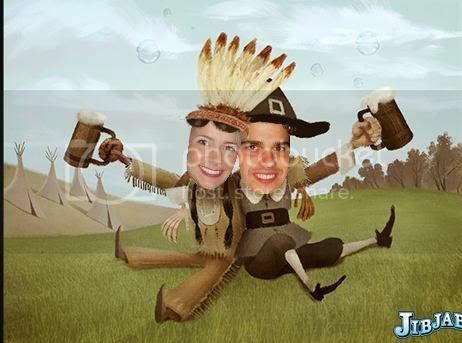 I do it every year for Christmas on Jib Jab, but have never done a Thanksgiving one...too cute! Hope your Thanksgiving was oh so happy and very filling too! LOVE you and DDHP!!! Hope you guys had a beautiful thanksgiving!!! Miss you (yes, even though I've never "met" you)...I miss you! !